The date of this Offering Circular is _______________ , 2006. The franchises described in this offering circular are for the operation of a retail ice cream outlet using the name DAVES HAWAIIAN ICE CREAM!. The initial fee is $40,000. The estimated initial investment required to open a franchise outlet ranges from $108,500 to $287,000. THE FRANCHISE AGREEMENT STATES THAT THE LAW OF THE STATE OF HAWAII GOVERNS THE AGREEMENT. THE FRANCHISOR HAS NOT REGISTERED ANY OF ITS TRADEMARKS WITH THE U. S. PATENT AND TRADEMARK OFFICE. THIS MEANS THAT IT HAS NOT OBTAINED THE PROTECTIONS AND PROCEDURES WHICH IT WOULD HAVE FROM A FEDERAL TRADEMARK REGISTRATION. Information about comparisons of franchisors is available. Call the state administrators listed in Exhibit 6 or your public library for sources of information. Registration of this franchise with the state does not mean that the state recommends it or has verified the information in this offering circular. If you learn that anything in this offering circular is untrue, contact the Federal Trade Commission and the state authorities listed in Exhibit 6. To simplify the language in this offering circular, the words "We", "Us", "Our", etc. mean the franchisor, Daves Hawaiian Ice Cream. 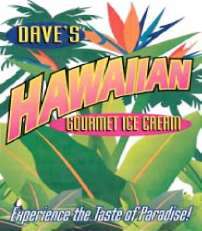 a Hawaii corporation, which was formed April 22, 2005 for the purpose of franchising DAVES HAWAIIAN ICE CREAM Outlets (Outlets). We are offering the franchises described in this franchise offering circular ("Franchises"). "You" or "Your" mean the person, corporation or other legal entity buying a Franchise from Us. Street, Suite 750,Los Angeles, CA 90013-2344. We do business only under the names DAVES HAWAIIAN ICE CREAM PARLOR and in certain instances DAVES ICE CREAM PARLOR (the Marks) and under no other name. Neither We nor Our Affiliate have offered Franchises in any other line of business. Our Affiliate has been making and selling ice cream for over 21 years, starting with a small ice cream parlor in Waianae in October 1982. There are currently 2 company-owned and 6 franchised Outlets, all located on the island of Oahu in the State of Hawaii. Our specialty is a rich, creamy ice cream made fresh daily in the State of Hawaii. Our gourmet ice cream begins with 14% butterfat, which delivers a rich, creamy taste and firm texture. Each of Our flavors are carefully selected and mixed to perfection. Quality is Our primary concern, so we only use the best wholesome products available on the market. When in season, fresh fruits are used in preference to canned or frozen ingredients. All liquor flavors are made with the actual liquor, which genuine flavor. Our Outlets now offer over 40 flavors, including the popular POHA, Lychee, Kuololo and Coconut Macadamia Nut flavors. attractive employee clothing, a training program which includes instructions in the preparation of Our food products, suggested sales presentations and techniques, distinctive interior designs, menu forms, advertising artwork and other materials and other business procedures together with an Operations Manual (the "Manual"). You must buy all of Your ice cream, ice milk, sherbet, water ices, yogurts and other desserts from Our Affiliate. You are not required to buy Our full line of products and select Your own menu items. You may buy syrups, toppings, cones and similar items from other suppliers so long as they have been approved by us. You must also purchase equipment and fixtures from Us for use in operating Your Outlet. A list of these items is attached to the Franchise Agreement. The existing Outlets average in size from 500 to 1200 square feet, seat from 6 to 25 persons and are typically in shopping centers or other high traffic areas. They emphasize well-trained, efficient and extremely personable managers and servers and serve a very high-quality food product prepared by well-trained chefs. Each Restaurant employs approximately 3 to 10 persons. Operating hours are generally 11:00 a.m. to midnight. Our Franchise and License Agreement (attached as Exhibit 1) authorizes You to open and operate one Outlet (Your Outlet") using Our Marks and System. The initial fee for one Outlet is $40,000, payable one half upon signing the Franchise Agreement and the balance prior to opening. The monthly royalty fee is 4% of Your Outlets Gross Revenues with a minimum royalty of $3,000 annually. Each Franchise Agreement has an initial term of three (3) years (the "Initial Term") beginning on the date You begin operating Your Outlet plus an unlimited number of additional three (3) year terms, subject to specified conditions, as described in this circular and in the Franchise Agreement. You will be responsible for obtaining a lease and all necessary permits, franchises and approvals to operate Your Outlet, as required by the law of the city and state where Your Outlet is located. the applicability of these and possibly other regulations in the area in which you are interested in locating Your Outlet and should consider both their effect and cost of compliance. We are not aware of any government regulation which directly affects the specific type of products sold by an Outlet. Mr. Leong is Our founder and has been Our President, CEO and Director since Our inception. Mr. Bulatao has been our Operations Manager since January 2000. Ms. Pauu has been our Factory Supervisor since April 1995. We have employed William E. King and Darchelle H.S.P. King to assist Us in selling franchises in the State of California. Mr. King has been a Sales and Lease Consultant with Elk Grove Toyota, Elk Grove, California, since March 2005. He was the President and General Manager of Proper Plumbing, Inc., Elk Grove, California, from June 2000 through March 2005. Ms. King has been employed by Southern Links as Accounts Receivable Manager since March 2003, was employed at Nails By Miki, Elk Grove, California, from July 2002 to February 2003 and by Proper Plumbing, Inc. from October 2001 through November 30, 2004. No person previously identified in ITEMS 1 or 2 of this offering circular has been a debtor in proceedings under the U.S. Bankruptcy Code required to be disclosed in this ITEM. You must pay Us an Initial Franchise Fee for each Outlet in the amount of $40,000.00 within 10 days after signing the Franchise Agreement. There are no refunds of the initial fee. (1) You must pay all of these payments to Us or Our Affiliate. None of these fees are refundable to You for any reason except for errors. (2) The Franchise Agreement defines "Sales", which includes the total of payments received as payment for providing all services or products sold at or from Your Outlet, for cash or credit. It includes revenues from any machines located at the Outlet. However, sales and similar taxes and the proceeds from the sale of used furniture, fixtures and equipment are excluded. (3) The Standard Royalty is credited against Your Minimum Royalty. (4) We may change the Standard Royalty upon 30 days written notice with a maximum increase during any two year period of 20% of Your prior Standard Royalty. (5) You must buy certain proprietary products from Us in order to ensure uniform quality and taste of the products. (6) We or Our Affiliate will pay 50% of Your newspaper advertising costs incurred during the first six months after opening Your Outlet if such advertising is approved by Us in advance. (7) If You request additional services from Us or participate in continuing training courses, You may be required to pay Us for Our reasonable costs and/or a reasonable fee for these services. (7) This fee is payable if You want to purchase any products from a supplier who is not approved by Us. If so, You may notify Us about the proposed supplier and instruct the proposed supplier to contact Us and follow Our procedures for becoming an approved supplier. You must buy all products from an approved supplier. (1) AMOUNTS: These amounts are estimated by Us based on Your establishing a new storefront Outlet, with new decor and purchasing all of the necessary equipment, and furniture and supplies. Our estimates are based on Our experience and the experience of Our franchisees in Hawaii. Your actual costs may be more if You establish a bigger Outlet and/or select higher quality or quantity items than We recommend. SEE IMPORTANT FOOTNOTES CONTINUED ON NEXT PAGE. (2) TRAVELING AND LIVING EXPENSES: Training is tuition-free, but You must pay for the expenses of attendance, such as lodging, meals transportation and wages of trainees. This estimate is based upon training 2 persons for 2 weeks. If any training is required to be repeated after the initial training course, We may charge You a reasonable fee to cover Our additional costs. (3) LEASE DEPOSIT: Unless You own the Outlet premises, You must lease or sublease the property from the owner. A typical Outlet may contain approximately 500 to 1,200 square feet of space. A lease often requires payment of the first month's rent, a security deposit and a second month's rent as a rent deposit. (4) SIGNAGE: Signs include exterior and interior signs for Your Outlet. Local codes and Your Lease may restrict the exterior sign which You may use at Your Outlet and affect its cost. You must also purchase signs containing Our logo. (5) FURNITURE AND EQUIPMENT: Your Outlet will need Our proprietary equipment used to create Our unique products, a telephone system, copy machine, fax/printing machine, calculator, typewriter, computer and accounting/business software as well as related equipment, supplies and uniforms. (6) INITIAL MARKETING EXPENSE: You must plan to spend at least $3,500 in advertising and marketing Your new Outlet as part of its grand opening. We will reimburse You for 50% of Your newspaper advertising incurred during the first six months after opening if they are approved by Us in advance. (7) MISCELLANEOUS OPENING COSTS: This category includes the estimated premium amount on a one year general liability insurance policy for property and liability losses and claims, as well as, workers compensation and errors and omissions insurance. The cost of insurance varies depending on many factors including but not limited to driving records and where You live. We will assist You in selecting appropriate insurance, but You should contact Your insurance agent and obtain premium estimates. (8) ADDITIONAL FUNDS: This category includes estimated payroll, utilities, vendor, royalties and similar costs during the initial phase of a new Outlet. We cannot guarantee that You will not have additional expenses starting Your business. Your costs will depend on factors such as how much You follow the Franchise System and procedures, the local market for these products and services, competition and the prevailing wage rates. (9) NOT REFUNDABLE: Except for security deposits, none of the above listed fees, costs or payments are expected to be refundable. We do not provide financing for any of these listed fees, costs or payments. You must purchase designated furniture, fixtures, equipment and supplies for Your Outlet from Us or Our Affiliate. You must purchase all products to be sold at Your Outlet from Our Affiliate or a supplier previously approved by Us. We currently make all of Our ice cream in Hawaii and will ship it to You as a franchisee. We estimate that the cost of required purchases of proprietary products from Our Affiliate will be nearly 100 % of Your products. During the calendar year 2004, Our Affiliate received $441,085 from sales to franchisees, which was 19% of its total sales during 2004 of $2,330,133. You may ask Us to approve additional suppliers of proprietary and other products. To purchase these items from another supplier, You may submit a form to Us. Based on the information and samples You supply to Us and Your payment of a $750 fee, We will review the items supplied and review the proposed supplier's financial records, business reputation, delivery performance, credit rating and other information. We will complete Our review in 60 days. IN OTHER ITEMS OF THIS OFFERING CIRCULAR. We do not offer direct or indirect financing. We do not guarantee Your note, lease or other obligation. We may be able to refer you to other sources of financing. 3) Loan You a copy of Our Operating and Training Manual. (Franchise Agreement, Section 5.4). C. Site Selection. We will not select an Outlet site or location for You. However, You must obtain Our prior approval of the location of the Outlet. Our approval of a site is no guarantee or assurance that the Outlet will be successful because success depends primarily on Your efforts and skills. D. Time Before Opening. We estimate that a Franchisee will typically open an Outlet between 2 to 4 months after signing the Franchise Agreement and paying the Initial Franchise Fee. The length of time may be affected by factors such as difficulties in obtaining licenses, Your lease, building or sign permits and delays caused by zoning or local ordinances, weather conditions, labor strikes, shortages of products and installation of equipment, fixtures and signs. E. Advertising. We may in the future provide advertising materials and services to You. These materials may include video and audio tapes, posters, banners and miscellaneous point-of-sale items. You may develop advertising materials for Your own use, at Your own cost. You must obtain Our prior written approval of these advertising materials. You may conduct advertising in print, radio or television media. We have established the Franchisee Advertising Fund into which We, You and other franchisees must contribute funds monthly. We will use these funds exclusively for advertising and promotional materials for the mutual benefit of all franchisees contributing to the Fund. You must pay for all advertising for Your Outlet. However, We will pay for 50% of the total costs of all of Your newspaper advertising for Your Outlet incurred during the first six months after its opening, subject to Our prior approval of form and content. You are entitled to be a member of the Franchisee Advisory Committee, which acts as an advisor to Us and the System. F. Electronic Cash Registers; Computer Programs. You Will be required to purchase computer programs for Your Outlet such as appointments and bookkeeping programs. These programs will operate on a typical computer system and are estimated to cost approximately $100 monthly. The programs are generally available from various sources. G. Operations and Other Manuals. You may review the Operating and Training Manual before purchasing a Franchise. However, You may not copy any of the information contained in the Operations Manual as it contains proprietary information. We may require that you sign a confidential agreement regarding the Operating and Training Manual. 1) The instructors for these subjects will include Mr. Leong, Mr. Bulatao and Ms. Pauu, each of whom has been with Us for over five years. 2) We may conduct these training courses several times each year. You must complete the Training course to Our satisfaction before opening Your Outlet. 3) We will provide Our operations training course to You and 2 crew employees as soon as possible after Your Franchise Agreement has been signed, depending primarily on when You and/or Your employees are available. Franchise Agreement. We will not operate and will not authorize any other party to establish an Outlet within a radius of one mile from Your Outlet. All necessary affidavits have been filed. You must follow Our rules when using Our marks. You cannot use a name or mark as part of a corporate name or with modifying words, designs or symbols except for those that We franchise to You. You may not use Our registered name in connection with the sale of an unauthorized product or service or in a manner not authorized in writing by Us. No agreements limit Our right to use or franchise the use of Our trademarks. There are no material determinations of the Patent and Trademark Outlet, trademark trial and appeal board, the trademark administrator of this state or any court; pending infringement, opposition or cancellation; or pending material litigation involving the principal trademarks. We do not know of any infringing uses that could materially affect Your use of Our trademarks. You must notify Us immediately after learning about an infringement of or challenge to Your use of Our trademarks. We will take the action We think is appropriate to protect the integrity and validity of Our trademarks. We are not required to take any specific action in regard to infringements involving its trademarks. We have the sole right to control administrative proceedings or litigation regarding any trademark infringements. We are not obligated to participate in Your defense or to indemnify You for damages if You are a party to a legal proceeding involving a trademark franchised by Us or if the proceeding is resolved unfavorably to You. You must modify or discontinue the use of a trademark if We modify or discontinue it. You must not contest Our right to Our trademarks, trade secrets or business techniques that are part of Our business. We do not require that You personally supervise Your Outlets. A full-time Designated Manager who has successfully completed Our training program and been approved by Us can directly supervise Your Outlets. The Designated Manager must have substantial operating experience, demonstrate strong management abilities and promote the positive image of Our Outlets. Each Franchisee Owner must sign a written agreement to maintain confidentiality of the trade secrets described in ITEM 14 and to conform with the covenants not to compete described in ITEM 17. Each "Owner" identified in the Franchise Agreement must personally guarantee the Franchise Agreement (Exhibit 2). You are not required to purchase Our entire line of products and may limit Your menu in accordance with Your best judgment. You may obtain syrups, toppings, cones and similar other items not offered by Us or Our Affiliate so long as they meet Our standards and specifications. We may change the types of authorized products and services that You must offer from Your Outlet. There are no limits on Our rights to make such changes. Initial term of Franchise is 3 years. b. Renewal or extension of the term. You may renew for an unlimited number of additional three-year terms upon written notice if You are not in default or breach. Written notice and no default. f. Termination by Us with cause. We can terminate only if You default, are insolvent or bankrupt, fail to pay invoices within 60 days or fail to increase Your minimum royalty by 15% annually. g. "Cause" defined -defaults which can be cured. You have 3 days after notice to cure a default in payment and 30 days to cure other defaults. Includes defaults in other franchise agreements. h. "Cause" defined-defaults which cannot be cured. Non-curable defaults: bankruptcy or similar action. i. Your Obligations on termination/non-renewal. Immediate obligations include no more use of trademarks or proprietary information, remove all Marks, return of all Our Manual and de-identification of Outlet. We have an option to purchase Outlet assets. k. "Transfer" by You - definition. Assign, transfer, share or divide in any manner. l. Our approval of transfer by You. We have the right to approve all transfers but will not unreasonably withhold approval. Payment to Us of 10% of sale proceeds and assumption of obligations by transferee. r. Non-competition covenants after the Franchise is terminated, transferred or expires. No competing business for 5 years. Only written and signed modifications. The agreement between the parties is limited to such agreement. Law of State of Hawaii. These states have statutes which may supersede the Franchise agreement in Your relationship with the franchisor including the areas of termination and renewal of Your Franchise: ARKANSAS [Stat. Section 70-807], CALIFORNIA [Bus. & Prof. Code Sections 20000-200043], CONNECTICUT [Gen. Stat. Section 42-133e et seq. ], DELAWARE [Code, Title 6, Chapter 25, Sections 2551-2556] HAWAII [Rev. Stat. Section 482E-1], ILLINOIS [815 ILCS 705/19 and 705/20], INDIANA [Stat. Section 23-2-2.7], IOWA [Code Section 75-24-51], MISSOURI [Stat. Section 407.400], NEBRASKA [Rev. Stat. Section 87-401], NEW JERSEY [Stat. Section 56:10-1], SOUTH DAKOTA [Codified Laws Section 37-5A-51], VIRGINIA [Code 13.1-557-574-13.1-564], WASHINGTON [Code Section 19.100.180], WISCONSIN [Stat. Section 135.03]. These and other states may have court decisions which may supersede the Franchise agreement in Your relationship with the franchisor including the areas of termination and renewal of Your Franchise. We do not authorize anyone to furnish any oral or written information concerning the actual or potential sales, costs or profits of a Outlet. Actual results vary from Outlet to Outlet, and We cannot estimate the results of any particular Franchise. Note: Numbers are as of December 31 of each year. The numbers in the "Total" column may exceed the number of Outlets affected because several events may have affected the same Outlet. For example, the same Outlet may have had multiple owners. A list of Our franchisees as of December 31, 2004 is attached hereto as Exhibit 2. Exhibit 3 is a list of the two franchisees who have had a franchise terminated, canceled, not renewed or otherwise voluntarily or involuntarily ceased to do business under the Franchise Agreement during Our most recently completed fiscal year or who have not communicated with Us within 10 weeks of the application date. Our audited financial statements are attached as Exhibit 4. THE LAST PAGE OF THE OFFERING CIRCULAR (FOLLOWING THE EXHIBITS AND ATTACHMENTS) IS A DOCUMENT ACKNOWLEDGING RECEIPT OF THE OFFERING CIRCULAR BY YOU. (3) TEN BUSINESS DAYS BEFORE A PAYMENT TO DAVES HAWAIIAN ICE CREAM. IF DAVES HAWAIIAN ICE CREAM DOES NOT DELIVER THIS OFFERING CIRCULAR ON TIME OR IF IT CONTAINS A FALSE OR MISLEADING STATEMENT OR A MATERIAL OMISSION, A VIOLATION OF FEDERAL AND STATE LAW MAY HAVE OCCURRED AND SHOULD BE REPORTED TO THE FEDERAL TRADE COMMISSION, WASHINGTON, D.C. 20580. I have received a Uniform Franchise Offering Circular dated ____________ , 20065. IIF DAVES HAWAIIAN ICE CREAM DOES NOT DELIVER THIS OFFERING CIRCULAR ON TIME OR IF IT CONTAINS A FALSE OR MISLEADING STATEMENT OR A MATERIAL OMISSION, A VIOLATION OF FEDERAL AND STATE LAW MAY HAVE OCCURRED AND SHOULD BE REPORTED TO THE FEDERAL TRADE COMMISSION, WASHINGTON, D.C. 20580.